Posted on February 11, 2016 at 10:32 pm. Road Rules: Are bike helmets required? Bike lights? Licenses? Question: Welcome to the bicycle question roundup. Questions about bicycles have been pouring in, and I’m going to try to tackle them a couple at a time, so this is part one. I don’t usually edit the questions much, but some of these had a strong bias, either pro-bike or anti-bike. I’ve tried to cut the bias and keep the question. Whatever your perspective, I hope these answers help to create harmony among cars, bikes and pedestrians. Please use this knowledge for good, not evil. Now, let’s get started. 1. Are bicyclists required to carry license, registration and proof of insurance just like a car since they are to follow the “rules of the road”? The simple answer is, no, they don’t. I’d be curious to see what kind of response you’d get if you tried register your bicycle at the auditor’s office or went to Department of Licensing to apply for a bicycle license, since those are not even options. The mandatory insurance law in Washington applies to registered vehicles (and even then has a few exceptions, including motorcycles), so bicycles are exempt from insurance requirements. While not very common, bicycle liability insurance is available and may be a good option for some cyclists. If you think bicycle insurance sounds odd, consider that much stranger insurance policies have been issued, including a cricket player who insured his moustache. 2. Is there a helmet law for cyclists? Washington does not have a helmet law for cyclists, but cities and counties can establish their own local helmet laws. None of the cities in Whatcom and Skagit counties have helmet laws, but in the event that you go an a cycling trip, the Department of Transportation has a list of places where helmets are required. Even though we don’t have a statewide bicycle helmet law, more and more cyclists wear them by choice. When I was a kid riding around the neighborhood with my friends, none of us wore helmets, except one kid that had a brain injury, caused by not wearing a helmet. I guess I didn’t get the irony of that at age 10. 3. Are there any rules around required lights on bikes — size, location, intensity, etc. — like there are for motorcycles, cars, trucks and buses? Before we get to the rules, I want to remind cyclists that if you ride without lights or reflectors at night, you’re nearly invisible to drivers and you will lose any confrontation you have with a car. Now the rules: When it’s dark, bicycles are required by RCW 46.61.780 to have a white light, visible from at least 500 feet, on the front of the bike and a red reflector, visible from 600 feet, or a red light, visible from 500 feet, on the back of the bike. 4. I see lots of cyclists texting while riding. Is that legal? It’s legal, but it’s dumb. Washington’s texting law applies specifically to motor vehicles, so a cyclist couldn’t be cited for texting while riding. However, that doesn’t relieve cyclists from their duty to ride responsibly, and a big part of responsible riding is paying attention. 5. I have never seen a cyclist stopped by the police. Do the police police cyclists? I’ve seen it a few times, but it doesn’t happen a lot. That makes sense, though. Cyclists make up about 4 percent of road users, so if police stopped cyclists at a similar ratio to cars, I’d expect that 96 percent of traffic stops I see would involve cars rather than bikes. Because speeding contributes to a significant portion of traffic stops, and most cyclists don’t even reach the speed limit, I’d expect that cyclists make up even less than 4 percent of traffic stops. That’s it for today, but there are still more bike questions so stay tuned for bicycle roundup part two. Road Rules is a regular column on road laws, safe driving habits and general police practices. Doug Dahl is the Target Zero Manager for the Whatcom County Traffic Safety Task Force. Target Zero is Washington’s vision to reduce traffic fatalities and serious injuries to zero by 2030. Ask a question. Posted on February 4, 2016 at 7:53 pm. Our friend Kip is hosting a gravel grinding event at the end of Feb. If you are into this kinda thing it will be a rippin’ good time. Blanchard Mountain is in peril! Posted on February 4, 2016 at 3:37 am. Posted on January 30, 2016 at 7:42 pm. If you want to learn how to service your fork check this out! Posted on January 28, 2016 at 8:31 pm. A little over a month until the Seattle Bike Show. Be sure to check out their site. Looks Cool! One of the attractions caught my interest specifically. PUMP TRACK! Riders can practice during the open sessions and then compete in a fun Pump Jam contest later in the day with great prizes in the afternoon. Bring your own bikes or use a loaner bike- (helmets mandatory, with protective clothing recommended). Posted on January 16, 2016 at 9:43 pm. This is certainly worth taking an interest in if you are interested. 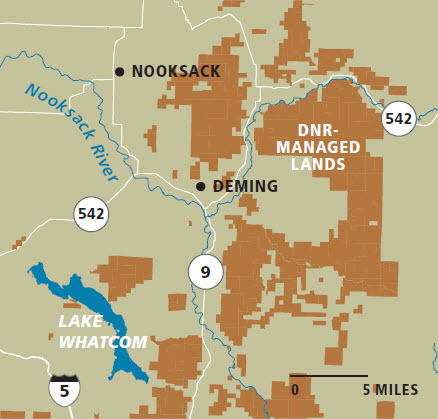 DNR is developing a plan to guide outdoor recreation on DNR-managed working forests across the Whatcom County area for the next 10 to 15 years. To view a map of the recreation planning area, click here. For a more detailed version, click here. Recreation Plan. Click here for enlarged map. Consider serving on our diverse volunteer recreation planning committee, which will be creating draft recommendations for the recreation plan. Click here to apply. To provide your feedback in other ways, send us an email or attend one of two open houses, below. To hear more about the project, sign up to receive updates on this project through our Baker to Bellingham E-news and connect with us on our Facebook and Twitter pages. Posted on January 9, 2016 at 9:25 pm. Hey All! Some all star volunteers came down today to help clean up the bum camp under the bridge near the Hub Bike Shop. Well it got us thinking that once a month we would love to keep this space clean. So February 13th at 11am if you are available to come help clean we would love to have you. Bring gloves and clothes to get dirty. With diligence this space could stay clean and keep unsavory characters and actions from happening this close to the shop. Thanks The Hub Staff. Posted on January 7, 2016 at 2:30 am. Well Happy New Year Ya’ll! We are opening Thursday January 7, 12-6pm and now you can get that New Years Resolution started right. Come on in to fix your bike up because this year you can do it, commute to work or school by bike. Maybe start riding weekly? Whatever your healthy resolution is biking can probably help obtain it. We have many commuter friendly and rural rippers ready to meet your needs so come on down and check us out. Posted on December 17, 2015 at 8:10 pm. Hey all, reminding you fine patrons about our Holiday Closures. We will close our doors December 19th at 6pm and open them back up at Noon on January 7th. We are also currently experiencing winter hours which are Thursday-Saturday 12-6pm. Posted on December 14, 2015 at 12:37 am. Here at The HUB we are suckers for themed group rides and the holidays provide a perfect excuse to decorate yourself and your bike and gather your friends. This week is the Mount Baker Bicycle Club’s holiday ride happening Monday, December 14. To read the MBBC’s December newsletter in all its glory, click here. Aslan Earth day, and other stuff, too! Bike to work and School Day! AKA PANKCAKE FEED! Copyright 2019 The Pedal Project. All Rights Reserved.